What is a rack house? Bourbon is aged in rack houses that are not climate controlled. Changes in temperature within the rack house are a major factor in moving the aging liquor in and out of pores in the barrel wood. Many other products can be aged in used oak bourbon barrels, including wine, scotch, rum and beer. Brokers and cooperages ship used bourbon barrels all over the world. Each barrel contains some residual bourbon in the pours of the wood. 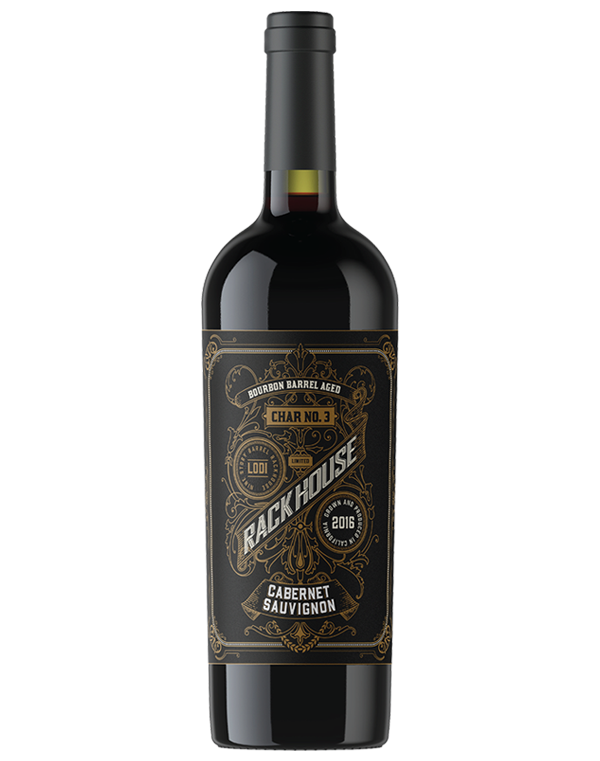 Rack House Bourbon Barrel Cabernet Sauvignon is a premier Lodi Cabernet Sauvignon that spends about 3 months in used Kentucky bourbon barrels. This unique ageing process imparts a wonderful flavor to our wine, with hint of Vanilla, Carmel and a bit of toasted oak the wine will dance across your palate. Rack House wines are fairly limited and are made in small batches. Try a bottle of one of the fastest growing wine categories on the market! Revolutionizing wine, one Bourbon Barrel at a time! The all new Rack House Bourbon Barrel Aged Red Blend uses 100% American oak, from use Kentucky bourbon barrels. The inside of the barrel is charred to impart flavors of toasted vanilla and brown sugar that integrate with the intensely rich, dark fruit forward characters of cherry and blackberry in this red blend. We age a small portion of our wine in used Kentucky bourbon barrels for 3 months to enhance the oak ageing process. The result is a refined, full-bodied blend with bold fruit flavors providing excellent structure and generous tannins. In all, it’s a super well-balanced red that brings all the black fruit flavors with toasty coffee and spice notes we want in a delicious bottle of red wine! The final product has wonderful richness and a full-bodied taste. Learn more about our wine. Interested In Purchasing RackHouse? Contact us today. © 2019 Rackhouse Wines. All Rights Reserved.